View of the Palace of Linlithgow in Scotland. 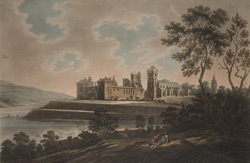 The palace is situated mid way between Edinburgh and Stirling on a promontory overlooking Linlithgow Loch. It has been a Palace since the 12th century and became the principal residence of the Stewart Kings of Scotland. In 1424 the original Palace building was destroyed by fire and James I ordered a program of building work and the palace was rebuilt. Later in 1488 when James IV ascended to the throne more he built a new range on the west side of the Palace and it was transformed into a suitable royal residence with apartments built around a central courtyard much like a French Chateaux. Mary Queen of Scots was born here. After 1603, and the Union of the Crowns of Scotland and Wales, the royal court moved to London and the Palace was used for short visits rather than as a long term residence.